If I'm being honest with myself, which is rarely the case since rationalization and self-delusion are a lot simpler and less painful, I want to be Larry David. And I could be. If I were more talented and successful. A lot more of both. The reality is I am way more George Costanza than Larry David. But, earlier this week I was able to, for one brief shining moment, enter a state of Larryism. This is because a lunch I went to this week turned into a full blown Curb Your Enthusiasm episode. And I got to be the star. 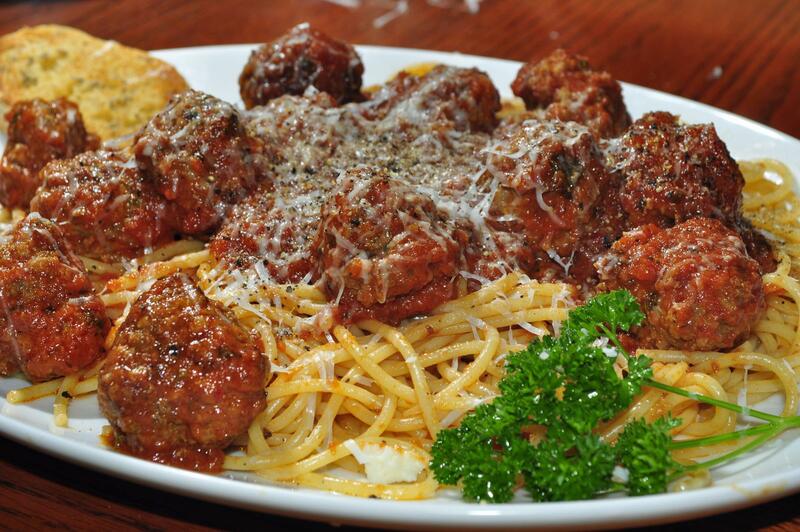 Wednesday was, apparently, National Meatball Day. I don't know if that is a real thing, but one Italian restaurant in town claimed it was, and sent out electronic coupons to help hungry folk celebrate this glorious day by offering spaghetti and meatballs for a measly $5. Including salad (or soup if you are so inclined, which is shameful if you are). The marketing was effective, and no one wants to be the person accused of ruining an important national holiday, so a group of us went to the restaurant for low priced pasta and balls of meat. Lunch was fine - delightful even. When I received my bill, I was charged a whopping $5.46 for the meal. The restaurant honored their deal, and we had helped observe the completely legitimate occasion. So excited was I, and so filled with pride in my celebration, that I paid with cash, which is a rarity in these troublesome times. So, I slapped down a ten dollar bill (a Hamilton, if you must in order to be trendy and so on), and waited for change while basking in my post-meatball glow. When the change arrived, the waiter (a very nice and efficient fellow), gave me back $2.45. At that point he left. Now is when Larry David entered the picture. I stared at the money and tried to parse out how we got to $2.45 change from a $10 bill on a check that was $5.46. No amount of cyphering could get me there. Now, this is not one of those rants about having to tip. I always tip. Even when service is terrible I tip. I usually overtip. Because I am not a monster. The thing is, I actually INTENDED to tip $2. That's a whopping 40% (pre-tax!). So, I wasn't upset that the waiter had kept $2. (Or, $2.09, I think. This is entirely too complex an equation to work through). My concern was that if I didn't explain the situation to the waiter and didn't leave an additional tip, he'd think I stiffed him. And I wasn't concerned he'd talk bad about me; he doesn't know who I am. My concern- truly - was that he would think I was intentionally not tipping, and he'd feel bad. I spent about five minutes waiting for him to come back, explaining the dilemma all the while to my co-workers. Who did not care. They were like a chorus of Cheryl Hinses telling me to just leave a tip and not worry about it. Finally, one of my co-workers slapped a dollar bill down in front of me and demanded we just leave. I kept trying to explain the situation, and explain what a good guy I am. No one was with me, and the all were just ready to leave. We walked out and got in our cars. As we were pulling out, our waiter ran out the front door waiving a cell phone. My cell phone. The guy driving stopped the car and I got out. I walked up to the waiter, and thanked him profusely for bringing out the cell phone. And it should have ended there. It did not. As I took the phone I said, "Oh, by the way, just so you know, you didn't give me back the right change." He apologized, and reached into his pocket to provide the correct change to me. I said, and unfortunately this is probably a pretty accurate recollection of my quote, and I swear I can even hear Larry David's accent come through on this. "No, you keep that. I just want you to know that I didn't get the change. So, you know, you got a tip. I didn't stiff you." This is where you could cue the Curb theme song, Frolic, to begin playing. You know the one. I think it has trombones and such. I could practically hear the voices of the supporting cast of Larry David's show yelling at me from the car and calling me terrible names. (My co-workers weren't doing that, but they were laughing at me). "You just keep that," I said with a wave as I awkwardly walked back to the car while the waiter just stared at me with an understandably dumbfounded look on his face. My co-workers laughed at me some more as we rode back to the office. I should have felt bad about it. I had experienced a true Larry David moment, and believe I could now write one act of a spec Curb script. So, I gotta tell ya, I felt pretty, pretty good.